Ever walked into a house and reached over to the long bank of light switches and spent two minutes turning lights on and off on and off trying to figure out which one turns on the light you want? Eliminate that frustration and simply push one button every time you enter a room. The long bank of switches is replaced with a single keypad that allows you to select your light scene. Going to bed, hit goodnight, having a dinner party, Hit Dine. 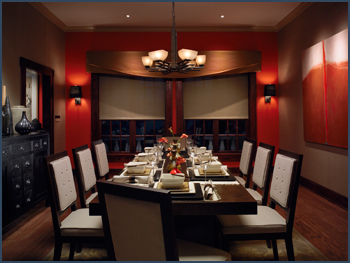 Artistic Systems can design a lighting control system customized to how you live every day. Get the lights you want, when you want. Lighting control forms an integral part of our home theaters and media rooms. Once experienced, you'll want it throughout your house. And with the newest digital technology, lighting control can be added just as easily to finished homes as to new construction projects. Increase security, conserve energy, add convenience and beauty to your home, with an Artistic Systems lighting control system.